2. 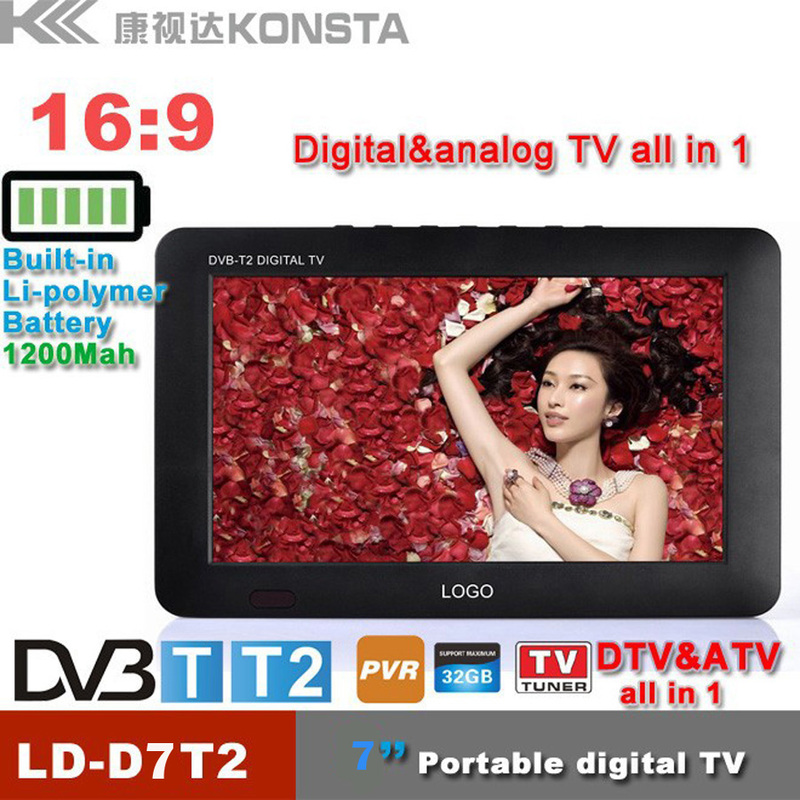 With analog TV also, DTV+ATV/ATV+ISDB TV all in 1 TV. 3. 12V input desigh for car, solar energy using. 4. Built-in Battery for portable use. 5. With USB jack, TF card slot, play the content of U-flash drive, support 1080P video, MKV, MOV, AVI, WMV, MPEG1-4, MP4, FLV, MP3, video, high birate decode. 6. 110V~240V universal power supply,DC input low to 12V with more safety. 7. Equipped with high-capacity rechargeable lithium batteries for outdoor using. 8. High sensitivity tuner,strengthens the signal receptivity. 9. DTV support HD TV program recorde to USB flash or Hard disk--(PVR)funtion. Good News:Place an order this week,you will get a car adapter together. 1. When you place an order,please choose a shipping method and pay for the order including the shipping fee. We will send the items within 3 days once your payment is completed. 2. We do not guarantee delivery time on all international shipments due to differences in customs clearing times in individual countries,which may affect how quickly your product is inspected. 3. Please note that buyers are responsible for all additional customs fees, brokerage fees,duties, and taxes for importation into your country. 4. These additional fees may be collected at time of delivery.We will not refund shipping charges for refused shipments. 5. The shipping cost does not include any import taxes,and buyers are responsible for customs duties. 2. We will refund you if you return the items with in 7days of your receipt of the items for any reason.However,the buyer should make sure that the items returned are in their original conditions. 3. If the items are damaged or lost when they are returned, the buyer will be responsible for such damage or loss,and we will not give the buyer a full refund.The buyer should try to file a claim with the logistic company to recover the cost of damage or loss. 1. Buyers may request for a replacement within 7 days from your receipt of the product.The buyer should return the product in the original conditions to us and should bear the shipping costs for return. 2. The buyer should return the product in the original conditions to us and should bear the shipping costs for return.If any part is required to be replaced, the buyer should also pay for the costs of the parts to be replaced. 3. Before returning the items,please confirm the return address and the logistics method with us. After you give the items to the logistic company,please send us the tracking number.As soon as we receive the items,we will repair or exchange them ASAP. 1. If you receive the parcel,we very appreciate if you confirm the receipt soon.If you agree our service,Please give us 5 star feedback. 2. If you here have problem,we always stay here to solve problem for you. 3. We don\'t accept any bad feedback without any communication. JEDX MP013 Mini Media Player Media Box TV Video Multimedia Player Full HD 1080P AU EU US Plug Gift free shipping!